Have you heard about our Sizzling HOT summer deal? It is almost too good to be true! It is too good not to missed! Book a 7-night stay and only pay R4350. Yes, you read that correctly… It’s a 7-night stay! Each Unit sleeps 4 Adults and 2 Children. TCs apply: Special offer valid to specified timeshare flats and dates as mentioned above | Booking are on a first come first serve basis and dependent on availability | All prices include a non-refundable admin fee of R450 and refundable breakage of R400. We invite you to contact us today to take advantage of this phenomenal special. Just act fast as our units and dates are limited! 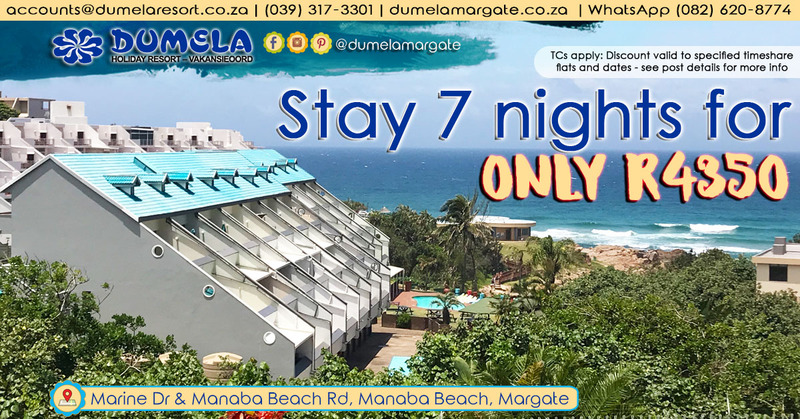 accounts@dumelaresort.co.za | (039) 317-3301 or WhatsApp on (082) 620-8774 valid during office hours only.